This video produced by Fabien Girardin of Pompeu Fabra University shows one Sunday's Bicing use in October 2007. In this video one can watch time-elapsed Bicing activity throughout Barcelona based on each station's location. During the day, the stations in the city center and by the beach are most heavily used. In the evening, Barcelona's citizens ride back to their neighborhoods. This video highlights the importance of logistics in bike-sharing programs. Barcelona is in a valley, so there is great demand for riding bikes downhill, but less interest in riding back up. Many other cities are experiencing this same thing as Lyon and Paris have hilly sections. Washington, D.C. has a downtown that is flat with surrounding neighborhoods uphill. Financial incentives could be a way to get customers to ride back uphill. Instead of the first 30 minutes of bike-sharing use being free, why not even pay the customer to ride to stations in less demand during certain times of the day or days of the week with program credit? Israeli newspaper, Haaretz, reports the government of Tel Aviv is looking for its own bike-sharing program to include 1,500 - 2,000 bikes and 100 stations. The contract would be for five years with a five year extension. The annual membership fee would be about 120 Israeli sheckles ($33 USD), with the first 30 minutes free to subscribers. Beyond this time, it would likely cost between $1.35 - $2.70 for each additional hour. Tel Aviv does require all cyclists to wear helmets, however, Haaretz reports, "The municipality is also hoping for an amendment to the helmets law in the near future, which will require the use of helmets only when using sports bicycles off urban roads." Just how bike-friendly is Tel Aviv? The city has 46 miles of bike trails with a total of 62 miles planned by the city's 100th anniversary in 2009. Additionally, Tel Aviv has a 5% bike mode share, which is greater than that of Lyon and Paris combined before the launch of their own respective bike-sharing programs. 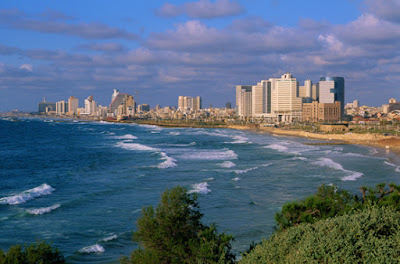 Tel Aviv's program could be the first of its kind in the Middle East. On a snowy Thursday evening this past week, over 400 Philadelphians converged at the Academy of Natural Sciences in Center City to discuss a concept that's taking North America and the world by storm, bike-sharing, naturally. The capacity crowd listened to representatives of the Bicycle Coalition of Greater Philadelphia, who were co-sponsors of the event, and Mayor Michael Nutter, a supporter of green transport, welcome attendees and introduce the evening's speakers. This event in all likelihood was the first bike-sharing conference to be held in the United States. An historic moment. Speakers at the event included Gilles Vesco, Vice-président Communauté urbaine de Lyon, who oversees the municipal government’s Velo'v; Nate Kvamme, Director of Humana’s Innovation Center, who assisted in developing their Freewheelin' program which is a high-tech bike fleet available for employee use at their headquarters in Louisville, Kentucky; and Mitch Franzos of Friends of the Riverfront, who with Dasani, piloted a high-tech recreational bike rental program called Blue Bikes in Pittsburgh, Pennsylvania. Philadelphia, or Philly as the city is known to its residents and others with an affinity for the place, is the perfect location for a bike-sharing program. One of North America's oldest cities, with many narrow streets, Philly feels like an older European city set on a grid street network. These narrow streets would be ideal to convert into bicycle boulevards, or bicycle-priority streets, with bike-sharing stations placed every two blocks. According to a co-organizer, Alex Doty, nearly a third of Philadelphia residents don't own cars. In addition, Philly is a university town with the University of Pennsylvania, Drexel, Temple, and a host of other institutes of higher education, so the potential success for bike-sharing in Philly is enormous. This kick-off event, which also included a more technical session the following morning directed toward Philadelphia government planners and engineers, was to show the public's support behind bike-sharing. Everything from the Website, poster to encourage event attendance, knowledgeable speakers, to the Take Action Webpage were well done. 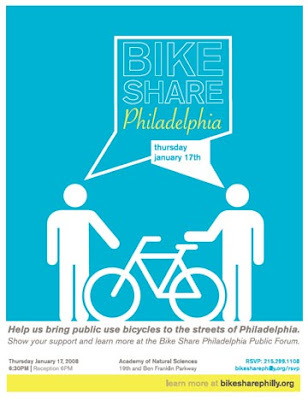 The Take Action page was created to further the voice of the event participants with an email to bikeshare@phila.gov which is collecting emails on the subject for the Philadelphia government. The event organizers understood how to hold a solid event and use the energy towards pushing for bike-sharing and make it happen now rather than waiting for it to simply happen in the distant future. I advise proponents of bike-sharing in other cities to use Philly's event as a model in developing their own local event. As Gilles Vesco reported from Lyon's mayor, "There are two types of mayors - those who have bike-sharing and those who want bike-sharing." Mr. Vesco reported that bike traffic is up 80% in 2.5 years since Velo'v was launched and 25% of this increase is from bike-sharing. The remainder of the increase is from an increase in the use of private bikes. With safety in numbers, Lyon residents are all biking more. In fact, every day 40,000 km are biked on Velo'v which is the distance around Earth. 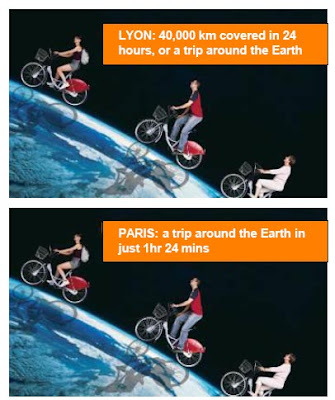 While in Paris, with the much larger Velib', a trip around Earth is made every 1 hour 24 minutes. As Nate Kvamme from Humana, a health benefits provider, said, "You often don't have a choice with your employer-provided health care benefits, but you do have a choice with your health." This statement hit the nail on the head and I have a feeling that within a short time from this conference, Philadelphia will have its own bike-sharing program up-and-running. This will create a greener Philadelphia with less traffic congestion, a healthier environment, and healthier populace. The Bikes Belong Coalition has created a 5 minute video on Vélib'. If you haven't yet seen these bikes in action, here's your chance. 11 million trips were made in the first 5 months of the program's operation. It still boggles the mind! 4) charge for first 20 minutes of the ride. I imagine the lack of a sufficient bike infrastructure is another cause of the Brussels flop. The governments of Paris and Lyon, for example, have made concerted efforts at improving their cycling infrastructure. This is proof that adding a bike-sharing program alone cannot be a panacea for a locality's transportation woes. It takes more than throwing some bikes onto the streets. While Brussels's program isn't presently doing well, I would hope both the local government and JCDecaux are taking note of these obstacles so that improvements are made to get Brussels Cyclocity back on track. 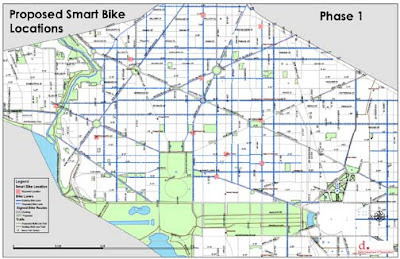 The goal for launching Washington, D.C.'s bike-sharing program, "DC SmartBike" is in March 2008. This will likely be the first 3rd generation (high-tech) bike-sharing program in North America. The pilot will include 120 bikes, 10 stations, and is to be run by Clear Channel Adshel, the provider of Bicing. The annual membership fee is likely to be $39 and the first 3 hours of each rental will be free. This fee seems reasonable, however, with 3-hr rentals, turnover and therefore ridership will be limited as individuals will likely keep the bikes longer. The proposed station locations include: Foggy Bottom, Georgetown, Dupont Circle, U Street, Shaw, Mt. Vernon Square, Metro Center, Logan Circle, McPherson Square, and Gallery Place. The District Department of Transportation has produced a map of the proposed locations for more detail. As the program is a pilot with fewer bikes and stations, there is a need to space the stations out more to cover a greater area and serve a larger population. However, I'm concerned that the stations will be spaced out too much. The service area is about 4 square miles (10.4 square kilometers) and in some cases the nearest station would be 1 mi (1.6 km) away. If I'm riding and my destination station is full, I'd be frustrated if I had to return the bike at the next closest station and figure out how to get back to my original planned destination. European programs aim to have stations every .2 mi (.3 km) and the DC program will have 5 times this. I predict that DC SmartBike will be popular with Washingtonians, however, I'd like to see a few tweaks to make it even moreso. Posted by Paul DeMaio at 11:57 AM 1 comment: Labels: Clear Channel Adshel, DC SmartBike, Washington D.C.
Looks like JCDecaux is getting a little sloppy in Paris. As reported by the U.K.'s Times Online, "[Paris mayor] Delanöe is threatening penalties against JCDecaux, the advertising firm that operates [Vélib'] because so many are out of service or in disrepair from overuse and vandalism. Decaux, which has been given a monopoly on advertising space in return for the bicycle system, has been unable so far to ease the problem of saturation in Paris when commuters arrive in the morning. The lack of docking space deters many Parisians from picking up Vélibs for the ride to work." Maintenance and logistics are large operational issues, especially in the largest of bike-sharing programs. I'm sure JCDecaux can get this back on track soon. While not what I deem bike-sharing (or bike transit), this bike rental concept planned for New York City does seem cool. Governors Island is a spit of land just southeast of Manhattan in the East River, which has had military purposes for hundreds of years, but now will serve as a park. Dutch urban design and landscape architecture firm West 8 will build "3,000 wooden bicycles for free use by visitors to the island, which is just a 10-minute free ferry ride from downtown Manhattan," as reported by amNew York. The bike rental is to be available by 2012 as part of a $400m renovation of the island. Sounds good, but make sure to wear long pants to prevent getting a splinter on your rump. 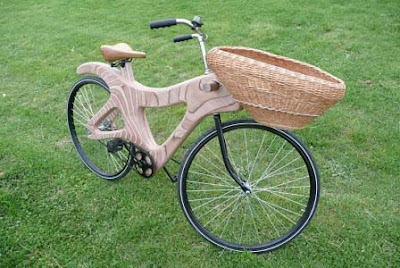 No, actually the seat does look like a normal cushiony bike seat as that it doesn't have any tree age rings, below. This begs the question, what is bike-sharing? 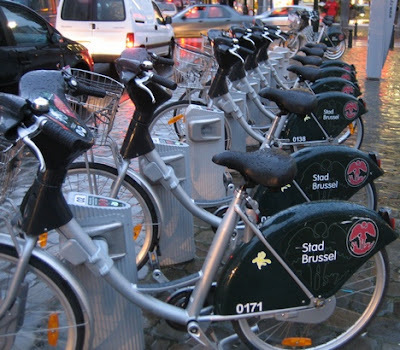 I look at bike-sharing as bike transit or transport for the sake of reaching a destination. Bike rental, on the other hand, is for recreation purposes. The Governors Island project has a recreational focus as no one lives on the island. There also is no lock on the bike, at least shown in the picture, so there could be an attendant to assist in releasing the bikes. I'm also not sure if this program will have one central or multiple locations. Bike-sharing must always include multiple locations and have bikes that are only released by the rider. I wanted to thank a friend of The Bike-sharing Blog for letting me know that he found pop-up ads and cookies upon opening the Blog. We've since gotten rid of the Web stats service which, unknowingly to us, must have recently started using these devices. We've switched to a different Web stats provider which does not use these devices, so you'll have a better experience with The Bike-sharing Blog. Now on with the bike-sharing content!